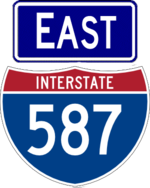 I-587, known as Colonel Chandler Drive, is a short interstate in Kingston, NY, connecting the Thruway with downtown Kingston. It has no interchanges, with a roundabout (formerly a traffic circle) where NY 28 (multiplexed with I-587 outside of the Thruway ramps) meets the Thruway ramps. 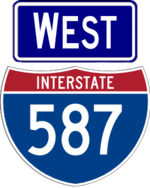 I-587 is not signed on the Thruway.